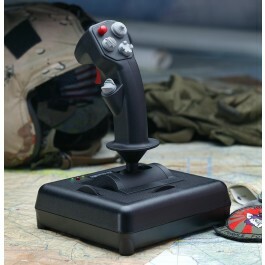 The Fighterstick offers a total of 24 buttons, three axis for aileron, elevator and throttle, and dual rotary trim wheels for precise adjustment of ailerons and elevators. The Fighterstick features three traditional push buttons, three 4-way hat switches, one 8-way POV hat switch, and one mode switch button. When used with the optional Control Manager programming software, the Fighterstick offers a total of 128 programmable functions, providing complete customization of your controller.